CHAMPAIGN, Ill. - Tim Beckman was named the 23rd head football coach at the University of Illinois by director of athletics Mike Thomas Friday. Beckman comes to Illinois after three years as head coach at Toledo, where he led the Rockets to two bowl appearances and a Mid-American Conference West Division co-championship. 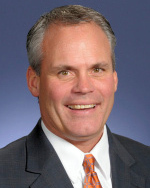 "I am very excited to introduce Tim Beckman as the new head football coach at the University of Illinois," Thomas said. "He brings an impressive resume to Illinois and is highly regarded within the entire coaching community. Coach Beckman sold me on his vision for Illinois football throughout the interview process. He is a proven recruiter, has worked alongside some of the nation's top coaches, will have high standards for academic and athletic success, and is a great fit for the Fighting Illini." "I certainly want to thank Mike Thomas, Chancellor Wise and President Hogan for this outstanding opportunity at the University of Illinois," Beckman said. "We will work tirelessly in building the football program to compete for Big Ten and national championships, and be a source of pride for Fighting Illini fans across the nation. We will recruit the very best student-athletes to represent the University and will work extremely hard to develop strong relationships within the state of Illinois."